It is no surprise that Canadians are scurrying across the boarder. Go into most Canadian stores and look for the same products in the United States and you will realize that we have been gauged for some time. With a dollar close to or above parity and even during the times of the strong dollar, Canadians paid at least 20% more than their American counterparts before taxes for the exact same products.This number has since shrunk to 14% but the greed of Canadian retailers is inexcusable and the reason why smart Canadians shop across the border. While a new report from the Bank of Montreal blames the Conservative move to raise duty-free limits on items purchased in the US, I am taking the opportunity as a consumer who is fed up of being gauged to make this point clear and hope others agree and spread the word: it isn’t the increase in duty-free that will kill our economy, it is greed that is sending Canadians across the border that is. 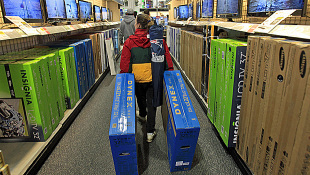 “A culmination of factors is likely to unleash a wave of Canadians cross-border shopping this summer in numbers not seen in two decades,” BMO chief economist Doug Porter said. In March’s budget, the Conservatives increased the duty-free limit on stays longer than 24 hours to $200 from $50 and for visits longer than 48 hours, to $800 from $400. Porter said that cross-border shopping has cost the Canadian economy over $20 billion. The Retail Council of Canada blamed multinational companies for charging Canadians more for goods than Americans and claim that this is the reason for the price gap. They also claim that federal duties, less competition and higher transportation costs in Canada are all contributing factors to the reason why Canadians are gauged at Canadian stores, despite the dollar being worth $1.02 US. Between 1995 and 2005, Porter said that the ratio of Canadian visits to the United States was one to one, now, the ratio is 2.7 to one. “There has never been more Canadians heading south than now. On the flip side … overall visits by Americans (to Canada) are now running at the lowest level in more than 40 years,” Porter said. Greed is to blame for lower revenues at stores and the loss of customers along with the loss of over $20 billion. The trick to getting more money is not raising prices to extremely expensive rates and keeping a small and unwilling group of consumers, the way to do so is to lower prices as low as possible and get a larger influx of customers. Retailers: if the government is the cause for your expensive prices that are doing Canadians no favor, do speak out. The problem of greed in Canada isn’t new, it’s been here for a while. Here’s how bad it was last year: Canada has been Consumed By Greed. So Canadians pay 14% more on the exact same products that Americans do on average, and then we are taxed more than Americans and now we learn that Canada lost $20 billion due to Canadian consumers shopping elsewhere. Should the federal government step in and remove the causes of greed in Canada?